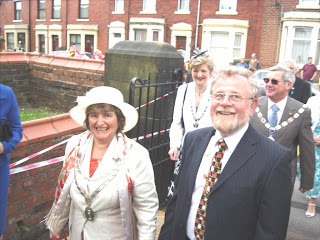 Medlar-with-Weshams newly installed Mayor, Cllr Linda Nulty attended Civic Sunday at Christ Church Wesham on Sunday 21st June. The Mayor, escorted by her Consort, Mr Richard Nulty was accompanied by Town Council members, the Mayor and Mayoress of Kirkham, LCC Cllr Liz Oades and civic dignitaries, together with the Rose Queens of St Joseph's and Christ Church. Representatives from the Scouts, Guides, Brownies and Beavers formed a guard of honour at the Church entrance together with many members of the public. The service was officiated by Rev Alan Leeson. Willing volunteers turned out on Sunday morning for the 'Operation Cleansweep' event. 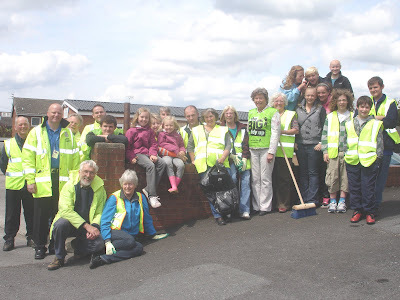 The morning was a great success with many bags of litter being filled leaving Wesham looking spick and span. The team consisted of Police and Fire service members, Wesham Community Pride Trust members and a special mention must be made to the young people who gave up their Sunday morning to help. Our thanks also to Bryan Ward at Fylde Borough Council who arranged for the tools to fulfil the tasks. Fylde East Independant County Councillor Liz Oades has retained her seat at Lancashire County Council defeating Conservative Candidate Simon Renwick and Labour Candidate Dennis Davenport.